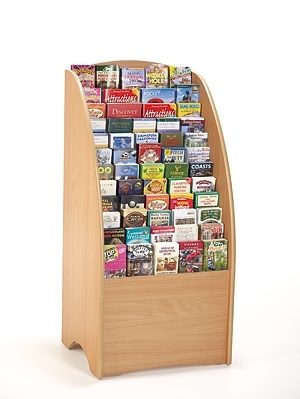 High quality wooden brochure and leaflet holder, Floor Display stand, with 84 slots. Also available in different colours and finishes please contact us in regards to these. Specially designed Wooden Displays for DL, A5 and A4 brochures and flyers. Ideal for medical centres, reception area displays, tourist information centres and exhibitions etc, display a variety of leaflets and pamphlets. 12 shelves of 800mm wide, 30mm deep. Each Shelf can display 7 facings of DL brochures, leaflets and flyers or a mix of sizes. 84 Slots for DL Leaflets or a mix of slots for DL, A5, A4 and other sizes. Overall Dimensions: 1249mm (H) x 806mm (W) x 501mm (D). Made to order - please allow 2-3 weeks lead time.